I am an scientist, sometimes forced to show my students very strange things like electron densities, force fields e.t.c. . To show such thing in 3D stereo movies should be nice. I have found commercial software for this purpose too expensive or non-existing, therefore I have written stereo mpeg encoder for several formats and an stereo mpeg player as well. IRIX – encoder is written in pure C – it works O.K., an modified version of player without Microsoft MFC is tested as well. It use GLUT OpenGL lib. The SGI hardware is very good equipped for stereo modes, but a bit slow for decoding. This samples are based on examples from 3D Studio MAX 1 character animation plugin. Disadvantage: Huge amount of data witch have negative influence of speed of decoding. It use non-standard mpeg format and therefor could not be played by non-universal mpeg player like Microsoft ActiveMovie or Direct Show. Advantage: No lose of quality. It is possible to play it , when stretched to full screen by the help of HW sync doubling. A bit more easy stereo decoding. Disadvantage: Huge amount of data. Difficult to watch stereo effect. Use non-standard mpeg format. Advantage: It can use standard MPEG 1/2 format. 2 times quicker decompression then 2 previous format. Possible to play in stereo by the help of HW sync doubling. This format could be usually played by standard MPEG decoders like Power DVD or Microsoft Active Movie with really optimized decoding routines. Disadvantage: Lose of quality in vertical direction. Impossible to see the stereo effect without spec HW. 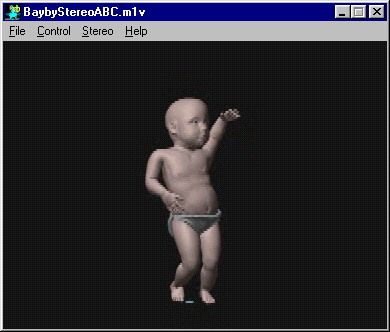 The player can convert mpeg stereo files to anaglyph on the fly. This image illustrate how is the picture crippled when the conversion from stretched above/below format to HW page swapped is done. I have produce more animation like the rose in the beginig of this page, but my www space is limited. I can send you som more, if you E-mail me.